Belfast-born Brian Ballard RUA will hold his second solo exhibition at the Gallery in March 2009. His contemporary approach to painting alternates between figurative treatment of nudes, landscape and expressionistic still life, all of which he practices in equal measure and intensity, and all of which are represented in this exhibition. 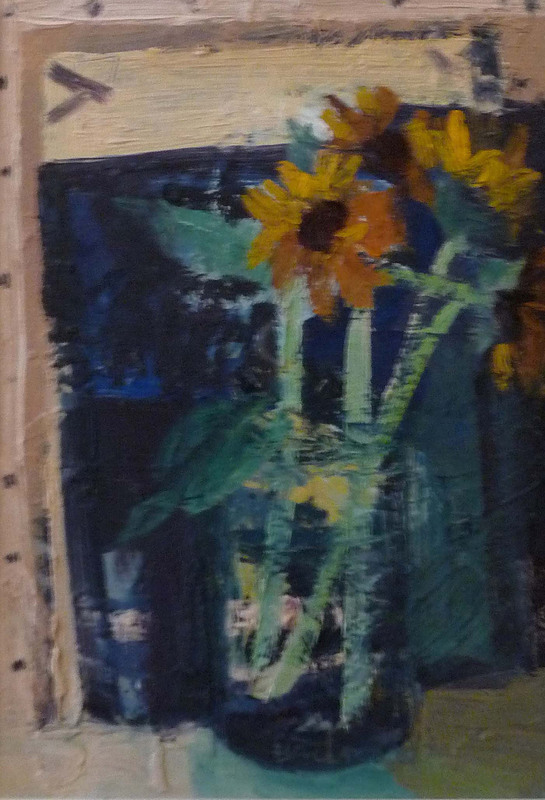 He is a rich colourist and, using vigorous brushstrokes, he fluidly applies slashes of colour, suppressing details in order to capture the essence of an object in a bold and spontaneous manner. 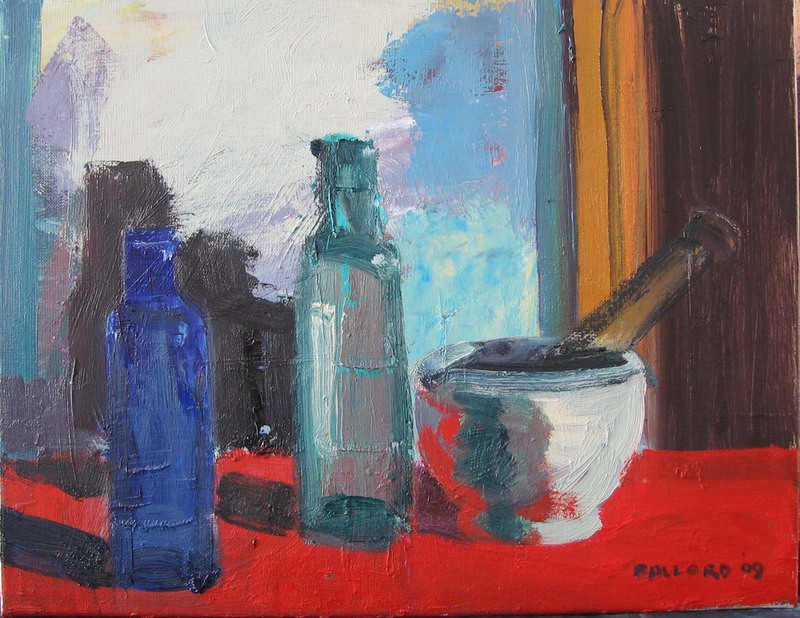 Ballard finds artistic inspiration in the ordinary things in life, for example a vase of flowers, an old iron, books, household items, a clock, and these are recurring elements in his still life compositions. 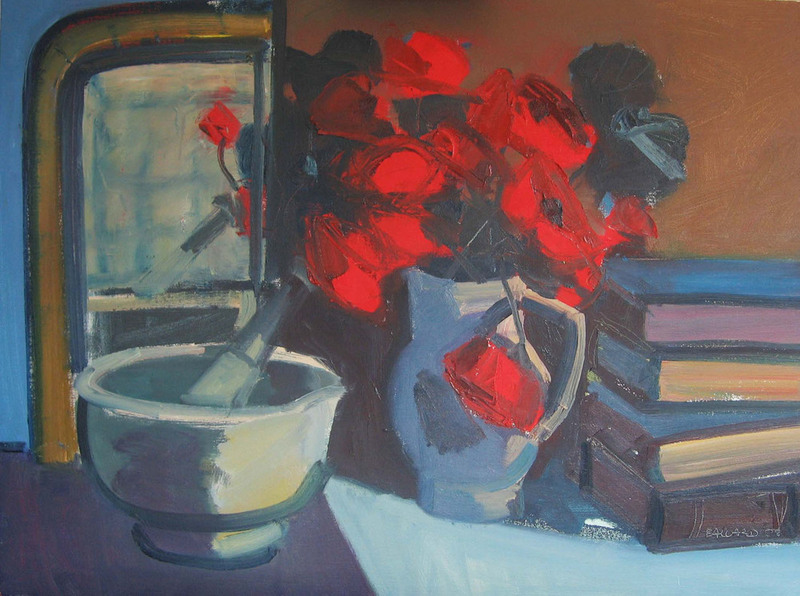 This exhibition includes a number of outstanding still lifes, a number of which feature a vibrant bunch of red poppies, contrasting dramatically with the more muted background tones, as in Poppies with Books. He also includes a striking, vertigo-inducing seascape, Dark Rocks, Orlock, executed in rich coral and turquoise hues. Ballard as an artist is intensely preoccupied with light and colour, both of which he sees as the definitive elements within his work. He proves himself continuously as a sensitive colourist who can effortlessly capture atmospheric qualities and achieve an overall tonal balance. Nowhere is this more evident than in the stunning nudes featured in this show. The beautiful Catherine in Red Jacket sees the model kneeling before a mirror. Her expression is pensive, yet the overall mood of the work is lifted by her striking red jacket. Catherine on Purple sees a semi-abstract figure reclining before a mirror. Her expression is not visible to the viewer, but she appears to be slumbering restfully, bathed in light from a source from outside of the picture plane. Brian has exhibited widely in the UK and Ireland ever since his pictures were first hung in the Arts Council Gallery of Northern Ireland in 1967. His work can be found in many public and private collections such as those of The Ulster Museum, Allied Irish Bank, National Trust and the Arts Councils of Ireland and Northern Ireland. The Private View will take place on Wednesday 4th March from 5.30 – 7.30pm and will continue until Wednesday 25th March 2009.